We specifically recommend the beach at Kiahuna Planation Resort. Enjoy 35 acres of sweeping lawns, koi ponds and lush gardens. We direct our guests towards the low-bank beach and calm, clear ocean, where tropical fish and turtles delight snorkelers. The locals refer to this beach as Kiahuna Beach. There are others that simply call it Poipu Beach. Regardless of what you call this amazing white sand beach, everyone will understand what location you are describing. 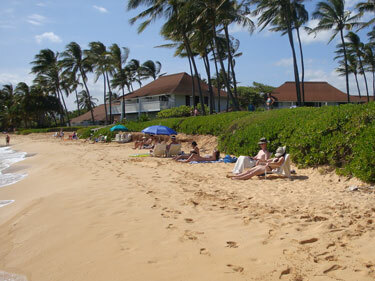 This beach is locateddirectly in front of the Sheraton Hotel and Kiahuna Resort. Return visitors and newcomers will love this beach. Activities in the ocean here are relatively safe due to the reef that protects this area.